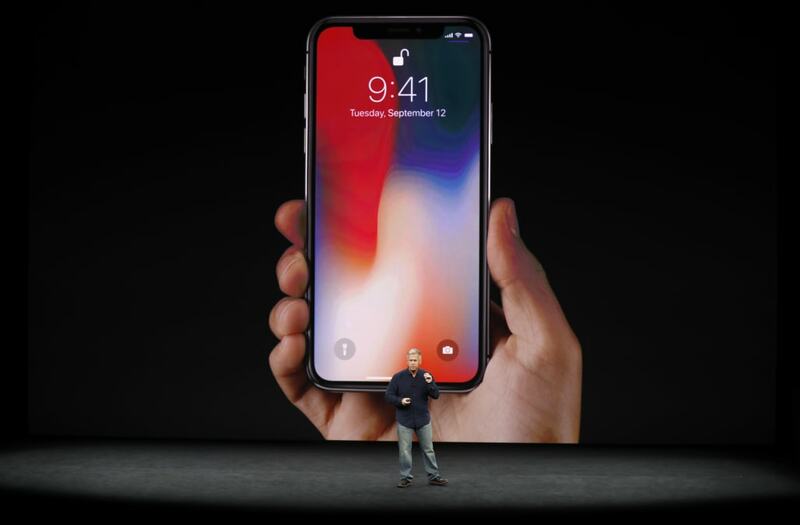 Apple announced the newest iPhone, the iPhone X, on Tuesday at its press event in Cupertino, California. It features a strikingly different design from its predecessors, like the iPhone 7. The screen uses a new kind of technology called OLED. Apple calls its the new display “super-retina.” Its’ 5.8-inches large. It’s a 2436 x 1125 pixel screen. Its chip is called A11 Bionic. It’s a six-core SoC chip with 2 high-performance cores, four high-efficiency cores, and a custom Apple GPU. It will come in two colors for now: Space Grey and Silver. To wake up the phone, you simply tap on the screen. There’s no more home button. “It’s a big step forward in the iPhone user experience,” Apple SVP Phil Schiller said. The iPhone will be locked until you look at it, which replaces the fingerprint sensor. Apple calls it FaceID. The front-facing camera has been updated with a ton of new technology to enable FaceID. The iPhone X is equipped with an A11 chip with a special part of it called "neural engine" to run machine learning and AI software. FaceID works with hats, glasses, and makeup. Apple says that there's only a 1 in 1 million chance that FaceID can be defeated by a random person. The iPhone X also has emojis you control with your face and the iPhone X front-facing camera. Apple calls them "animojis." The 3D camera will also supercharge apps like Snapchat. “No other device in our lifetimes has had the impact on the world that the iPhone has,” Apple CEO Tim Cook said. “Our intention with iPhone has always been to create something so powerful and so immersive that the hardware virtually disappears,” he continued. Apple also launched two other iPhones on Tuesday, called the iPhone 8 and the iPhone 8 Plus.